More than 72,000 residents living in the danger zone of the erupting volcano have been evacuated. Regional correspondent Arlina Arshad entered the zone 5km away from the crater and found spiritual guardian Jero Mangku Darma, 75, still staying put. Balinese Hindu spiritual guardian Jero Mangku Darma calmly climbs up the stone steps of a temple smack in the volcanic danger zone of the pulsating Mount Agung, lights a joss stick and makes an offering of flowers, betel leaves and yellow rice. Kneeling before a pagoda with his clasped hands raised to the sky, the 75-year-old solemnly prays for protection from the wrath of the spirits living within the island's tallest and holiest mountain, which has been spewing ash and cold lava and displaced more than 72,000 people. "Oh God, grant us safety, grant us endless bounty, grant us the best guidance," he pleads, ending his mantra with a sacred call for peace in Sanskrit. "Om Swastiastu. Om Shanti, Shanti, Shanti." And as if the heavens are heeding his prayers, the volcano rumbles and the rain comes down hard and fast. The pungency of sulphur fills the air. Mr Darma is a pemangku, one of the hundreds of temple guardians who the local people believe have the power to communicate with mountain spirits in Bali - such as in Mount Agung in Karangasem district - and appease them through sacred rituals such as hikes to the crater to make offerings of buffaloes, goats and chicken. He lives in the village of Sebudi, which falls in the no-go "red zone", only 5km away from Mount Agung's peak. I am a descendant of generations of pemangku, I cannot leave... 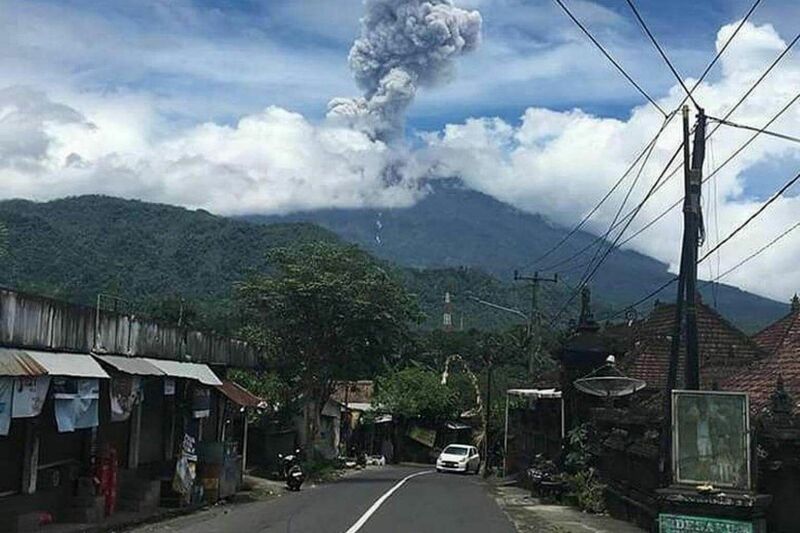 The spirits of Mount Agung are angry. I must pray and ask for forgiveness... I'm a pemangku, I'm not afraid. My life belongs to the mountain. BALINESE HINDU SPIRITUAL GUARDIAN JERO MANGKU DARMA, whose father, the pemangku before him, died in 1963 when Mount Agung last erupted. The authorities raised the alert to the highest level on Sept 22, following a spike in seismic tremors, and ordered people living within a radius of 10km from the summit to evacuate to safer areas. All left except for Mr Darma. As he tells The Sunday Times at his home, he will not budge unless he receives "divine instruction from dream whisperers" through clues such as "fire, smoke and rocks". "I am a descendant of generations of pemangku, I cannot leave," he explains. "The spirits of Mount Agung are angry. I must pray and ask for forgiveness." Indonesia, which sits in the Pacific Ring of Fire, is home to around 130 active volcanoes. These "fire mountains" hold spiritual significance in the land of mystics, where pawang hujan, or rain shamans, can be hired online to bring good weather on wedding days, and shamans with names like Ki Joko Bodo or Ki Samber Nyawa - equivalent to the Grim Reaper - are paid millions of rupiah by politicians to ensure election victories. Many of the volcanoes are guarded by spiritual keepers, who inherit the position from their forefathers or are appointed by sultans or the local community. In Java, the responsibility rests on the shoulders of one person, called the jurukunci. In Bali, the burden is shared among the pemangku of the many temples that dot the slopes of the volcanoes. Each has a single mission: to look after his own volcano and ensure it does not endanger the lives of people. "The belief in the mystical and superstition is part of local culture and remains strong till today," Indonesian historian Anhar Gonggong tells The Sunday Times. "The spiritual guardians consider it a big sin to reject the job. If they say no, they believe they could be cursed with accidents, like falling off a motorbike. Death is a job risk they must accept," he adds. Indeed, some have met a tragic end while trying to tame nature. Just seven years ago, the famed spiritual keeper of Java's Mount Merapi, 83-year-old Mbah Maridjan, was killed when the volcano erupted, raining searing ash clouds called "wedus gembel" - which means curly sheep because of their appearance - over his home, situated 5km from the crater. His body, when found, was caked in white soot and prostrate in the typical Islamic prayer position. Bali's Mount Agung also claimed the life of at least one pemangku when it last erupted in 1963. He was none other than Mr Darma's father, Jero Mangku Sabda. He and his wife died with more than 1,000 others. Their only child, Mr Darma, escaped with a minor leg injury. "If I don't take over from my father, I'd be cursed with madness. "I used to follow him to meditate and perform ceremonies on mountains in Java, so I know what to do," Mr Darma says. "I have prepared my only son, Gede Ardana, for the job. When I die, he will be the next pemangku." "Don't bother with Darma, he's an orang gila! Only crazies will tempt fate by staying put on an erupting volcano," a motorcyclist zipping down the volcano tells The Sunday Times when asked for directions to Mr Darma's house. Sebudi, which is in Badeg Dukuh in Karangasem district, is a virtual ghost town, with all its houses emptied out and only animals left behind. Dogs are howling, roosters crowing, and cold lava, known as lahar, flows ferociously down a nearby river. Nearby, a handful of people are either collecting wood, tending to their livestock or selling flower offerings to passing vehicles. All say they will return to the evacuation shelter for the night. Mr Nyoman Puspa, 40, points to a truck by the roadside. "That's ours. We are well prepared. Fuel is full tank, the engine is running and the front of the truck is facing the exit road. "The moment the mountain coughs, we run," he says. "And we run faster than lightning. The pemangku can stop our minds, but not our legs," another villager quips with a laugh. Advances in science and technology and better information have made it easier to monitor volcanic activities or mitigate their impact these days. 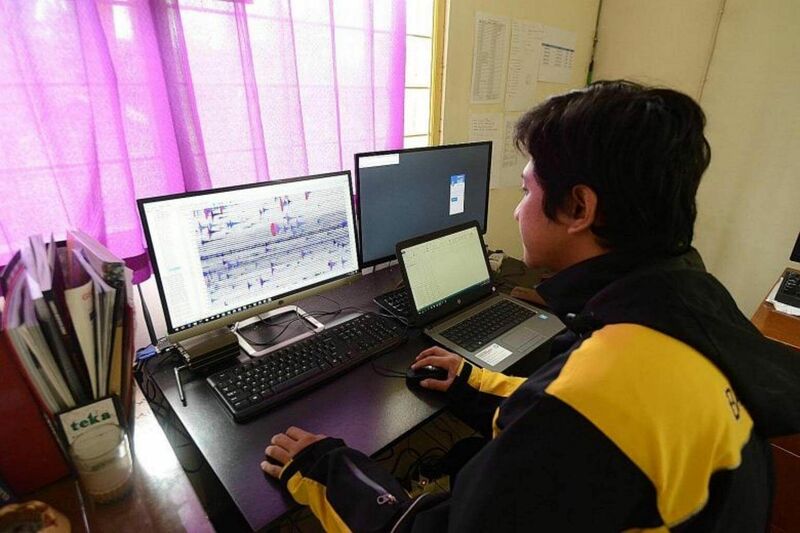 Mr I Gede Suantika, the head of the volcanology and geological disaster mitigation agency, said the authorities monitor Mount Agung's seismic activity round the clock through six observatory posts around the volcano, and six more in neighbouring Mount Batur. He added that Global Positioning System sensors provide a topographical map of the volcano to look for deformations, such as changes in the height of the crater which indicate magma activity within the volcano. The data is transmitted via radio every six hours to help rescuers doing evacuation work. "We can't predict if and when Mount Agung will have a major eruption, but currently the eruption is effusive," he says, meaning that the lava is contained in the crater and flows down the sides of the cone. 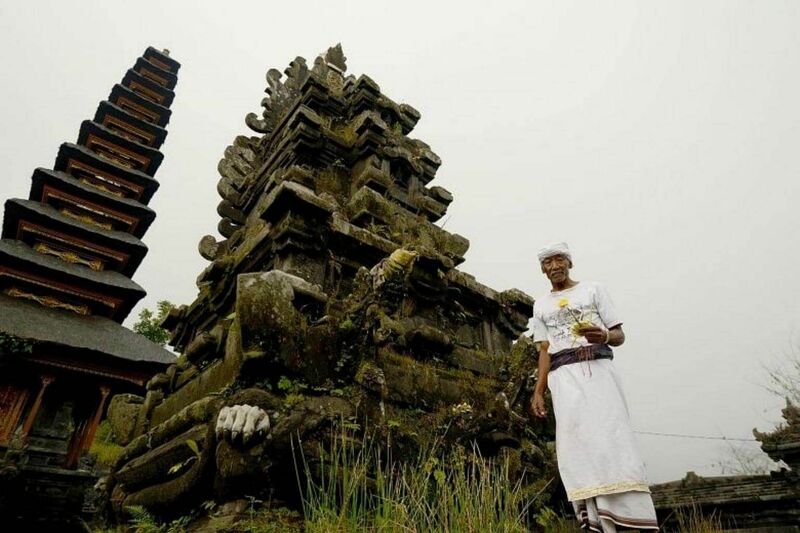 The Parisada Hindu Dharma Indonesia, the highest Balinese Hindu authority, says locals have learnt to combine spiritual knowledge and modern technology to ensure their well-being. "The equipment to detect eruption in a more scientific and precise way must also be considered a gift from God. It can't exist without the grace from God," Mr I Gusti Ngurah Sudiana, the group's chief in Bali, tells The Sunday Times. "But science is also limited," he says. "We still need the spiritual guardians to pray to shift the flow of lava so it won't hit villages. 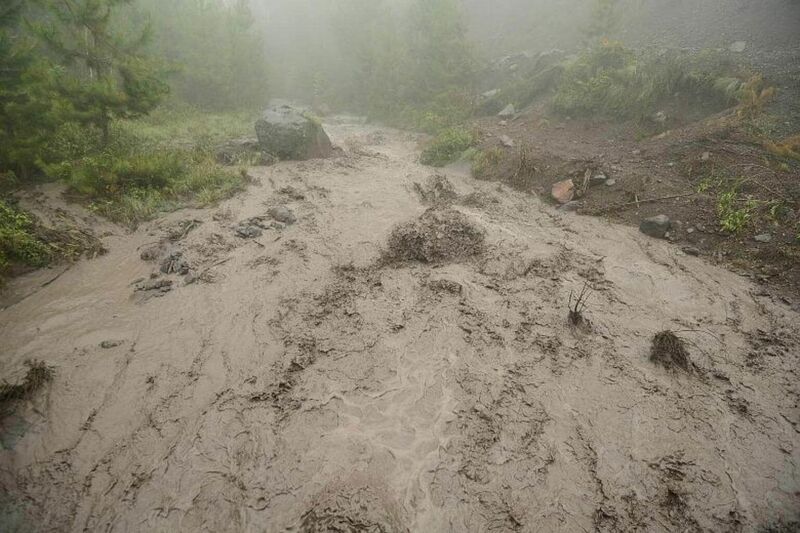 They cannot stop eruption, but they can pray that the effects will be less devastating, that the eruption will bring blessings such as fertile lands, and not curses such as fatalities." The work of the pemangku is therefore never done, even if it endangers their safety. In September, four went up to Mount Agung's summit to offer prayers and later posted on YouTube a video showing plumes of steam rising from the crater . Earlier this month, another pemangku, 42-year-old Jero Mangku Mokoh, and his elderly father-in-law trekked up to the crater to retrieve a red talisman thread that they had buried there. Their actions led National Disaster Management Agency (BNPB) spokesman Sutopo Purwo Nugroho to warn people not to copy the pemangku. "Mount Agung is still erupting... The sulphurous fumes are harmful. Anyone who goes there not only puts his own life at risk, but also the lives of rescuers," he tells The Sunday Times. Defending the pemangku, Mr Darma says they were only fulfilling the request of divine "whisperers" and it was not their intention to burden the authorities. Pointing to a black walkie-talkie given to him by a local police chief, he says: "The police beep me often to ask if I'm all right. They say I must call them if I'm in trouble." Tourism on Bali has been hit badly since Mount Agung had a major eruption on Nov 21, which forced the main Ngurah Rai International Airport to close for nearly three days and flights to be suspended. Several countries including Singapore issued advisories, telling their citizens to defer travel to Bali until the situation improves. When The Sunday Times was there last week, it found that many hotels had slashed their rates by more than half. The malls and restaurants in the tourist districts of Kuta, Candidasa, and Tanah Lot were quiet and offered discounts. Bali contributes around 40 per cent of Indonesia's total tourism revenue, according to the Tourism Ministry. Indonesian officials have assured travellers that the resort island is safe, even though eruptions remain unpredictable. They have also urged countries to lift their travel warnings. "The volcano is 60km away and the effect of the eruption is limited to within a 10km radius from the crater," says Mr Herson, the head of the airports authority for Bali and East Nusa Tenggara. The Tourism Ministry is setting aside 100 billion rupiah (S$9.9 million) in the next three months to mitigate the impact on Bali's tourism industry, the Jakarta Post reported, with the industry's potential losses this year estimated to be US$1.2 billion (S$1.6 billion). President Joko Widodo held a Cabinet meeting in Bali on Friday, rolling up his trousers to wade in the sea and taking wefies, in a bid to reassure visitors that the island is safe. A day later, however, Mount Agung had a small eruption, sending ashes up to 2.5km high. BNPB said the alert level for the 8-10km radius surrounding the volcano remains at its highest, but the rest of the island continues to be safe. Back in Sebudi, the elderly Mr Darma is planning another trek up to the summit - one that will take him at least three hours - to make an offering to the spirits. "I'm a pemangku, I'm not afraid. My life belongs to the mountain."